Here’s a must-have accessory for your MacBook. 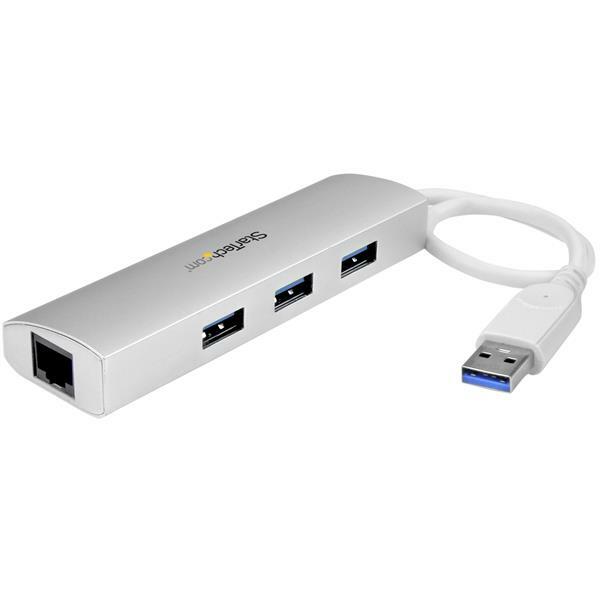 This portable USB 3.0 hub merges your USB peripheral and RJ45 network connections into a single, convenient combination hub. It gives you two vital connection types that are often missing from modern, port-limited laptops. This silver, sandblasted USB hub matches the finish of your MacBook, and because it features a solid-aluminum casing that’s both lightweight and rugged, it’s perfect for travel usage. 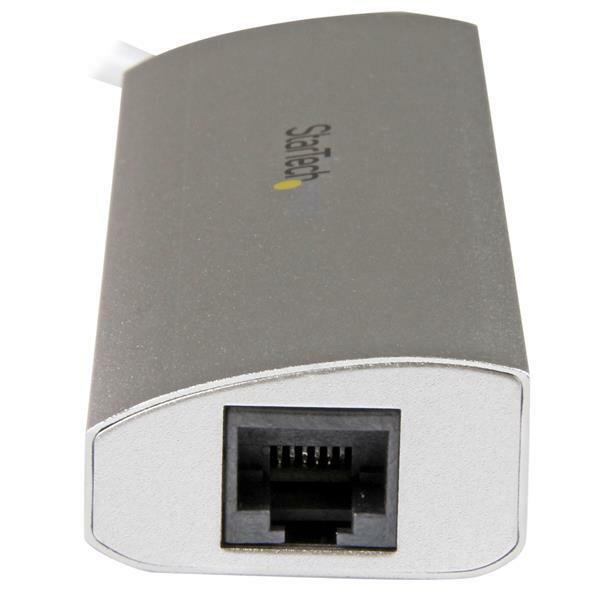 It also integrates a lengthier, 27 cm (10.5 in) cable, so you have the flexibility to place the hub, your devices, and your network connection, exactly where you need them. 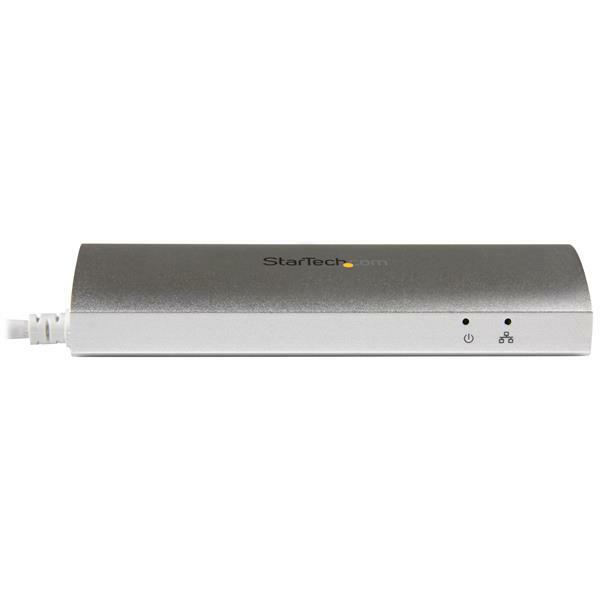 This high-quality, Apple style USB hub features a Gigabit Ethernet port, giving you an easy way to expand your MacBook connectivity. And because the hub integrates a Gigabit Ethernet port, you can add wired network connectivity to your laptop in a location where Wi-Fi® is unreliable or unavailable. 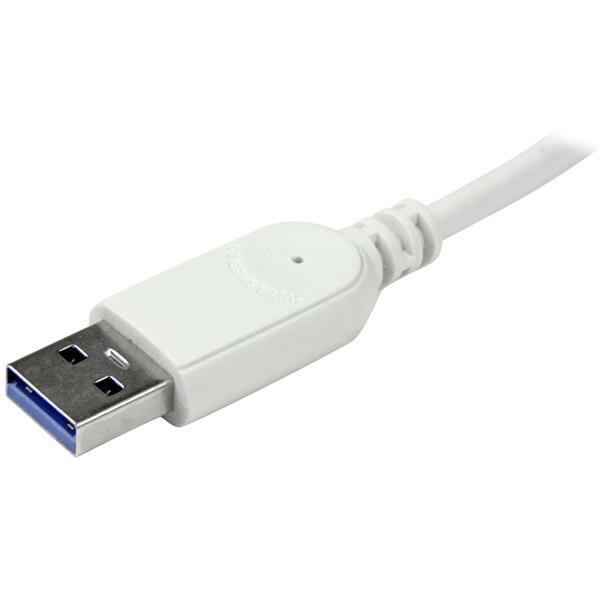 The hub’s built-in USB cable has sufficient length to reach your laptop’s USB 3.0 port, regardless of where the port is located. Plus, the stylish hub features three USB 3.0 (also known as USB 3.1 Gen 1) ports in a compact housing. And, its silver, sandblasted finish provides a unique and trendy look when compared to traditional hubs. The hub features a rugged yet lightweight housing, so there’s no need to sacrifice dependability for portability. With its compact, USB-powered design and a built-in USB cable, you can tuck the combination hub neatly into your travel bag, and avoid the nuisance of carrying multiple separate adapters. This USB 3.0 hub is perfect for travel, such as back-and-forth trips from home to office. Plus, the compact hub takes up minimal space on a desk, so you can use it in hot-desk or BYOD (Bring Your Own Device) environments. This bus-powered USB hub installs quickly and easily, and it’s natively supported in Windows®, Mac, and Chrome OS™, with no additional drivers or software required. You can also avoid the nuisance and cost of purchasing new devices by using the USB 3.0 hub plus GbE with your current USB 2.0 and 1.x devices. 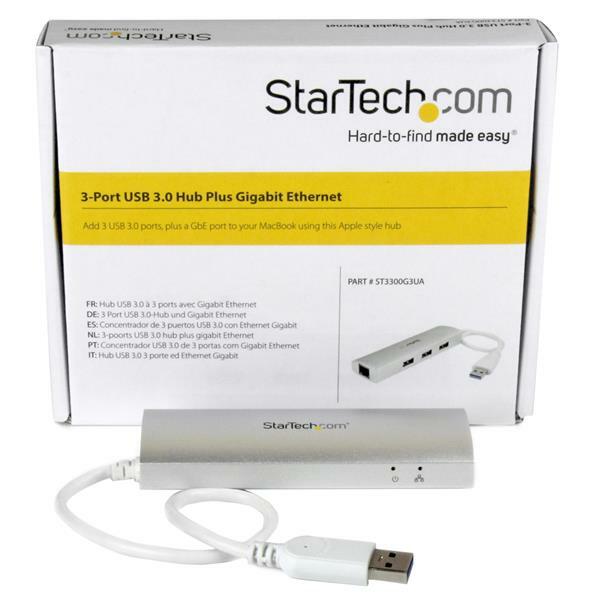 The ST3300G3UA is backed by a StarTech.com 2-year warranty and free lifetime technical support. My network connection stops working after I wake my macOS computer up from sleep mode. What do I do? If your ST3300G3UA is connected to a computer running macOS, and the network connection stops working after you wake the computer up from sleep mode, you can temporarily resolve this issue by unplugging and plugging the ST3300G3UA back into your computer. This will resolve the problem until your computer is put to sleep again. To permanently resolve this issue, make sure you have downloaded and installed the latest macOS drivers from the ST3300G3UA product page. If these latest drivers do not resolve your issue, check to see if your ST3300G3UA is revision B. This is marked on the ST3300G3UA's ID label and box. If your ST3300G3UA is not revision B, contact StarTech.com support for further assistance.